All graphics and information on these pages belong solely to YTNR. Please don't copy or remove anything from these pages. 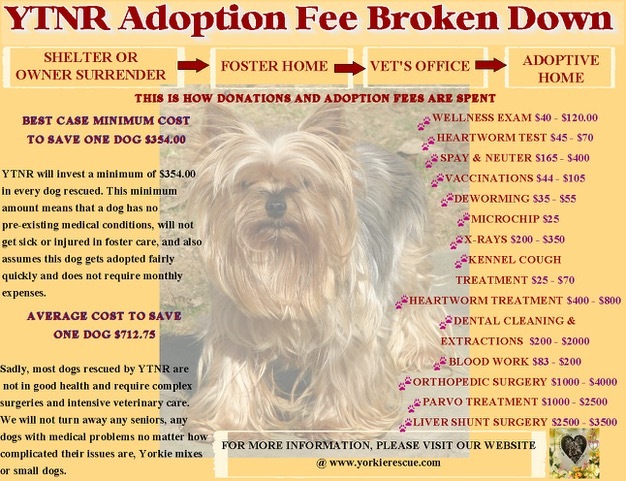 To rescue a Yorkie, a minimum donation to Yorkshire Terrier National Rescue is required based upon on the age and condition of the dog and medical expenses incurred beginning at $150 plus a $25 fee for Microchipping. Each dog is Microchipped before going to it's new home. Read about our Microchip Policy here. If you are interested in a Yorkie that is not in your home state, you may still send an inquiry, however, every effort is first made to place the dogs locally, however in some circumstances we do allow the adopted families to come pick the dogs from their foster home. 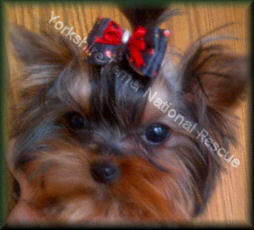 We tend to have more people willing to rescue our Yorkies than we have dogs available. While this may mean that you may have to wait a considerable amount of time before a rescue becomes available, it is the best possible situation for our Yorkies needing new "forever" homes. You must fill out the form to be put on the waiting list, and someone in your area will contact you. Come see our Special Needs Dogs here. These dogs need extra help. Any donation you can make will help us help little dogs like this needing extreme emergency care. Hi everyone, you may remember Pogo who is now Bentley from last summer. He was adopted by a wonderful lady and her son. They both adored Pogo/Bentley and he adored them. Do to unforeseen circumstances Bentley has been returned to YTNR, believe me it was not because he was not loved or wanted. His owners are very upset that that had to return him. He is about 2 - 2 ½ years old and weighs about 13 pounds. Bentley if you remember does not have good use of his back legs. So sadly we are looking for a new home for him, he is a sweet boy, loves riding in the car. Crazy about going for walks and running around in the yard. He can be like a little clown at times keeping you entertained. Bentley has a wheel cart and loves tooling around in the cart. Please know he can be protective of his person. He is a special boy looking for a special family. Looking for a home without small children, gets along with other dogs. His new foster parent says he is doing very well in their home and will cuddle in his lap with his foster siblings. Because of the issue with his back legs he does have accident in the house, he does potting outside also. He is neutered has had his vaccines and is microchipped. So if you have it in your heart to adopt Pogo/Bentley and the time to give him the love he deserves please add his name to the application when filling it out. You will not be sorry! Adoption donation is $500.00, includes Microchip. Bella is now ready for adoption. She was saved from a high kill shelter in horrible condition. We think she was a former breeding dog. She had mammary tumors (benign) which have been removed, her rotten tooth removed and has had all her vaccinations and is microchipped. Bella would do best in a home where her new family would be retired or home most of the time. She has some separation anxiety. She loves to be held. Bella weighs about 8 pounds and should gain another pound. She is about 10 yrs old, which is not that old for a Yorkie. She needs eye drops for her dry eyes and has poor vision in one of her eyes. Bella need a secure fenced yard as she is a runner and will dash out an open door. She is not interested in other dogs, only her person. She would be a great companion for a homebody. She uses wee wee pads. Please fill out an adoption application and name Bella as your new best friend. Adoption donation is $500.00, includes Microchip. This precious little girl is Grace. She is estimated to be about 12 years old. She is very friendly, sweet, and quiet. She enjoys sitting on your lap, or beside you on the couch. She gives kisses upon request. She loves her food, but most of all, she loves to go for a walk. She is good in the car, although she will walk around the car to different windows if not confined. She gets along very well with other small dogs, but has not been seen with cats, or large dogs. She gets along with children over the age of 8 as long as they are mature enough to handle small dogs. Unfortunately, Grace's teeth have not been well taken care of, but due to a heart murmur, anesthetic dental cleaning is not an option for her. Because of the heart murmur, Grace may need to be on medication for the rest of her life, but because of her small size, the cost will be minimal. Grace is a small girl weighing in at 6.9 pounds, and she's a beautiful black and silver Yorkie. She is full of love. Grace would do well in a home with a stay-at-home mom or dad, or other small dogs her size. Grace is micro chipped, vaccinated, heart worm tested (negative) and is spayed. If you're looking for a great companion, put "GRACE" on your application. Adoption donation is $100.00, includes microchip. Paddywak came to us from a high kill shelter in L.A. He seemed so very small and compliant, not especially reactive for an 11 year old boy. He had never been nuetered and his breath could knock you over from bad teeth long uncared for. When he was placed in the home among the greeting family of yorkies he seemed ready to do his job which seemed to be mounting any willing volunteers. There were none and he was quickly rebuffed and soon avoided. Paddywak had to learn a new way of life. From his reaction to things this little boy had never been talked to, loved or played with by a human and apparently was only bred to reproduce. Housetraining was a puzzle to him and affection quite foreign. Today this little boy is a new "person". He has had all his shots, neutered and fresh breath. His teeth cleaning really meant removing rotted teeth that didn't even bleed.....there was only infection left in the gums. He is healing, happy and attached at the lap. Sit down and he becomes part of you, move to the next room and he is by your feet. Bedtime is the best time because then he is snuggled up next to you in bed. Life has never been so good ! He is cautious with strangers but always gentle. When the others bark at imagined bad mailmen and other dangers Paddywak joins in but nothing comes out. Wherever he lived before they made sure he didn't complain so they had him debarked. Little guy, big love now. He is ready for his best home ever! Adoption Donation is $250, includes microchip. Here is Lucy, She is a beautiful silver Yorkie mix weighing about 12.5 lbs. She was a former breeding dog until she was rescued and learned what it was like to have human companionship and cuddles. Lucy is guessed to be about 8 years old. She has some medical issues that are being controlled with simple medication. Lucy likes to ride in the car with you and go for walks. She is bossy with other females, so it would be best if she were paired with male dog companions. No cats though - she doesn't care for them. If you would like a nice stay at home doggie to be your lap dog, Lucy is your gal. She is vaccinated, heart worm tested, microchipped and spayed. Please fill out an adoption application and list Lucy as your next companion. Adoption donation is $450.00, includes Microchip. This is Raffie. He is approximately 3 years old and weighs 13 lbs. Raffie was pulled from a shelter where the family had left him, saying they didn't have time for him and he was 'too active'. Raffie is very spirited and needs to go to a home with an experienced dog owner. He can become possessive once he is comfortable and bonds to one person. While he is loving and playful, he was not socialized when he was younger and is sometimes fearful. Raffie should be the only pet in an adult only household. His perfect new home would have a yard to play in or an owner that would walk him regularly for his much needed exercise. Here are Sir Charles and Lord Bartholomew - or Charlie and Bart to their friends. They were surrendered to our Rescue when their lifelong momma passed away. The boys are litter mates that were born January 1, 2007. At 12 years old, they are healthy, happy, well adjusted little Yorkies. They are fully vaccinated, microchipped and are housebroken. They love to ride in the car and go for walks. We are committed to adopting them together as they cry when they are separated. They sleep cuddled up together in one tight ball so you can't tell where one ends and the other begins. Bart (the blonder boy) is the more outgoing and curious brother. Charlie is more passive and cautious. Both are loving and active dogs that behave like they are half their age. If you would like to add the joy of these beautiful boys to your home, fill out an adoption application now. Adoption donation is $400.00 for both dogs. Hello, my name is Dudley. My foster mom thinks I’m around 8 yrs old and I am a fit and trim 10 pounds. 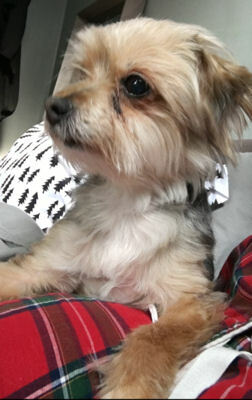 I’m a sweet and affectionate little Yorkie that was forced to live outside alone when my owner passed away. Although I am blind, I have no problems getting around. I love to take walks around the park and explore all the sounds and smells of the outdoors. I am very secure in following you around on my leash, once I have the chance to know and trust you. My ideal home will be with a person or couple who can spend quality time with me. I need to live indoors with you, and I am not picky as long as I have a clean, comfy and familiar place to call my own. My favorite thing is to cuddle and have my head rubbed, it’s the nicest thing I’ve felt for a long time. I have no problems being alone for a few hours at a time, but I need to be let outside to do my business (I will let you know since I don’t want to have any accidents in the house). I need a calm and loving home with no children, though I would love the company of another small dog or cat that will be gentle and understanding of my condition. Adoption donation is $300, includes microchip. Lady is such a sweet girl. She loves to be in your lap and loves giving kisses. Lady lost her right eye in an accident last year. She also had un-diagnosed diabetes, which left her almost completely blind in the other eye. She does get around the house well, as most dogs adapt really easily to losing their sight. . She was not previously potty trained, but she is getting the hang of it. You have to take her outside and watch her. Lovely Lady is a 9 year old dog that weighs 9lbs. She is the sweetest and most loving dog that always answers to her name and acts like a puppy most of the time. She is happiest when she is with her person and loves to spend time with you, sitting on your lap and giving kisses. She is not potty trained and wears a diaper when inside. She will generally do her No. 2 outside as long as she gets outside a few times per day. She would be a good dog for someone who is home a lot as she has separation anxiety. She seems fearful around cats, and should be an only dog in the house as she gets jealous around other dogs. She does great with teenagers but it would be best if there were no young children. She is up to date on vaccinations, is spayed and microchipped. Come and meet this little cutie and you will fall in love instantly. Adoption donation is $300.00, includes Microchip. Meet Max. 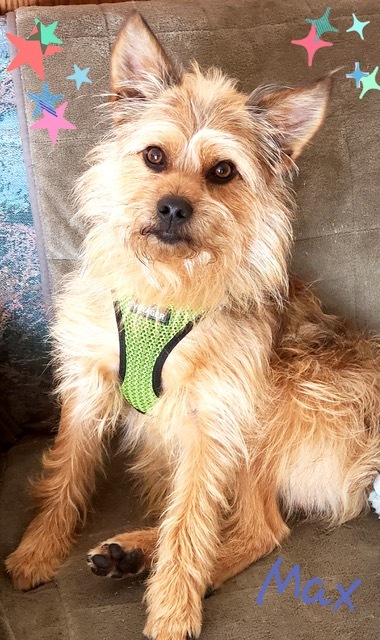 He is a 16 month old Yorkie/ Border Terrier (possibly) mix. He was an owner surrender. Max is just a love bug. He wants to be everywhere his person goes. He will share a bed with you but also likes the floor. He loves riding in the car or laying curled up next to you on the couch. Max will need a large fenced yard to run around. He knows how to use a doggy door and enjoys the freedom to go in and out. He loves to play fetch. He will come with his toys! Max is good with both larger dogs and tiny dogs, he just wants to play. He is also fine with cats. Max will need an active family to keep up with his youthful ways. He has been around children and does fine. So, if you are looking for a lively and fun, loving addition to your family, Max is the one for you. Please fill out an adoption application and name Max as your new best friend. He is UTD on shots, neutered, and micro chipped. If you are interested in Max please add his name to your application. Adoption donation is $550.00, includes Microchip.